California White Water Rafting Trips! For over 20 years we have been refining our whitewater rafting programs and guides to make Rock-N-Water the optimum place to take your Christian youth group, school, or family rafting. At Rock-N-Water, it is our goal that every day is a full day of opportunities for fun adventures, personal growth, and group unity. Our staff are not just rafting professionals, they are also dedicated Christian youth workers committed to serving your students with adventures customized especially for them. Take your youth group, friends, or family on a California white water rafting trip on one of California’s greatest rivers. River rafting trips are fun and a great way to develop new friendships, teamwork and unity. Crash through whitewater rapids together on a whitewater trip that will leave your group with fantastic memories for a lifetime. Class III River Rafting Trips – Take your group on a river trip. From beginner to intermediate white water river rafting trips are perfect for Middle School, Junior High School, and Senior High School aged students. 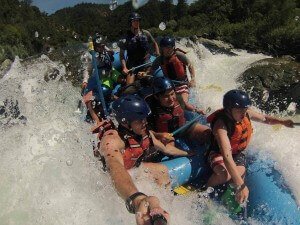 Class IV Rafting Trips – Intermediate to Advanced California river rafting in California for High School, College groups, and adults that are looking for a bit more adventurous option. Class III Inflatable White Water Kayaking Trips – For High School youth and older. 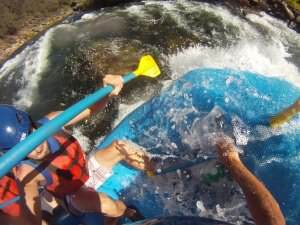 Hit a whitewater rafting river in two person inflatable kayaks that put you eye level with the rapids. The South Fork of the American River – South Fork American River white water rafting trips offer many options to visitors. From learning about Sutter’s Mill and the start of the CaliforniaGold Rush, to boating down the river. Our Splash About is a hands-on experience with Class II and III whitewater on the South Fork of the American River. 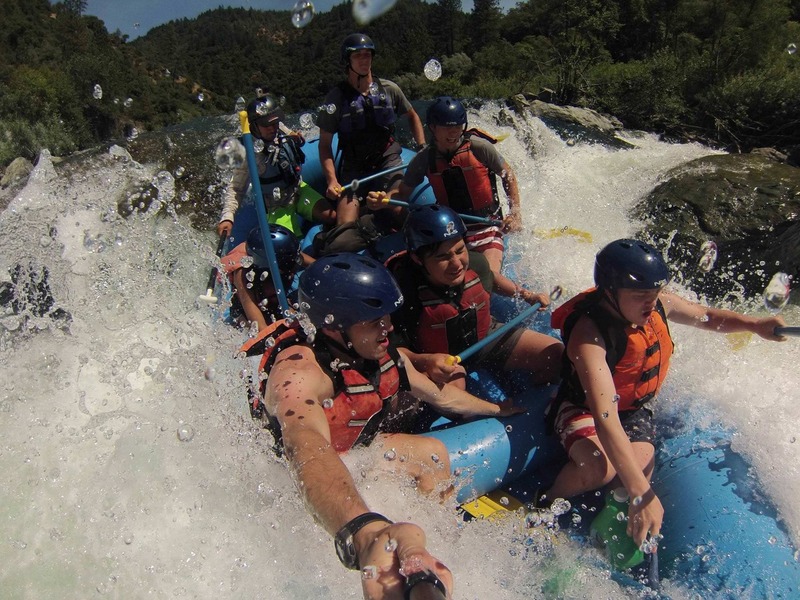 The Middle Fork of the American River – The Middle Fork American River is a remote and isolated river that offers Class IV rapids through our Ruck-A-Chuck river rafting experience for high school students and up. The North Fork of the American River offers class V rapids that, while an excellent rafting experience, is not an optimal fit for our primary audience of families and Church youth groups. We can recommend a outfitter if you would like to raft the North Fork American River. River Classification System – Learn about the six class river difficulty rating system, and how you can use it to get a general idea of how one rapid or river might compare to another one. What is Included – What does a whitewater rafting trip with Rock-N-Water include? Accommodations and Facilities – What are the accommodations like? What kind of modern conveniences can I expect while I am going river rafting with Rock-N-Water Christian Camps? Rock-N-Water is a Christian camp with a passion to impact youth, families, and church groups with the joy of God’s Living Word through outdoor adventures like whitewater rafting. We focus our adventures on biblical principles, and we use the help of nature, friendship, and challenge to help develop character. Learn more about Rock-N-Water. Our rafting basecamp is located in Northern California about an hour West of South Lake Tahoe. We are situated directly on the South Fork American River. Although we do have showers and flushing toilets, our campsite is rustic. We eat, sleep, and play outdoors and wouldn’t have it any other way. By default, each of the above multi-day California american river raft trips have you arrive around 7 PM the night before (eating dinner before you arrive), and leaving around 6 PM (eating dinner on the road) at the end of your last adventure. If you would like to do the same on a one day trip, it’s just an extra $20/person. Multi-Day rafting trips require a minimum of 10 people. If you live more than 3 hours away, or you just want to finish your trip with even more awesomeness, we recommend you add dinner and another night of camping & campfire time to the end of your trip for just $20/rafter. Again, please contact us if you have any questions, or are not finding exactly the California rafting trip or American raft experience that you are looking for near you.